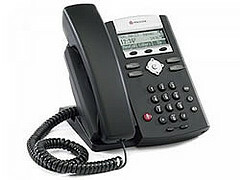 Land line telephones are provided in most offices and a few cubicles. You may call anywhere in the U.S. by dialing the area code and number (i.e. (999) 999-9999). Most office phones also include voicemail service and can be administered by a online, web-based utility. Monthly telephone fees are billed to your campus department or administrative unit. The most common phone at UCDC is the Polycom 320 pictured to the left. In addition there are telephones in the elevator lobby on floors 4 - 11. You may make local calls on these telephones. Speakerphone and teleconferencing services are available in conference rooms and classrooms on the 2nd and 3rd floors. Please contact Information Services to arrange for a speakerphone and/or teleconference. For information about using this phone and other telephone services at UCDC see the links below.